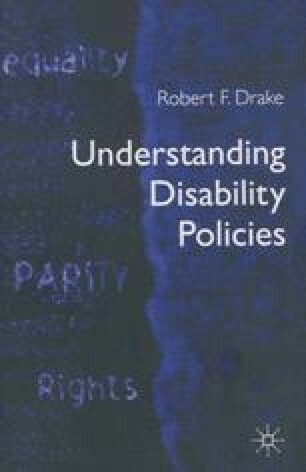 In this chapter, I consider the impact of contemporary social policies on older disabled people. My main argument is that policy responses that concentrate on interventions at the individual level can fail to meet the social and environmental concerns that disabled elderly people express. To highlight this mismatch, I take data from an action research project in South Wales with which I was involved in the early 1990s, and use other material drawn more broadly. I discuss some of the key problems that disabled older people encounter, including the habit of policy makers to conflate their needs with those of the wider (non-disabled) population of older people. Finally, I analyse some of the responses that older people have made to policy issues.